Innomech has designed and developed an automated test station for Fluidic Analytics to process and analyze up to 96 protein samples in a single run and without any operator involvement. The protein samples ready for testing are in the wells shown above on the left, with the stack of 96 disposable chips on the right. The new test station which works alongside the company’s Fluidity systems for protein sizing and quantification will be used for on-going R&D studies targeting new protein characterization applications and for product development. It will also be used to improve the efficiency of final performance testing of production units before shipping them to customers. The new station automates a series of time-consuming and repetitive liquid handling and sample processing steps that are required when analyzing multiple protein samples. 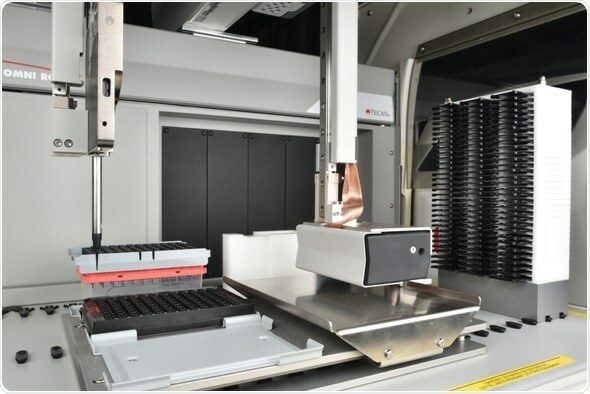 The automated system, which is based around a Tecan Cavro Omni Flex liquid-handling robot, is programed to sample a protein solution into a disposable chip before transferring it into a reader. The robot then waits for the analysis to complete before returning the chip to its original location. The new test station will also be used to process and analyze multiple standard samples to determine instrument performance and as one of a number of final performance checks on production units.